As a credit counseling agency, the term “high credit limit” can be troubling to us. The higher the limit, the higher the spending potential. And as we know all too well, credit card spending can get very expensive when it accrues interest. In fact, for many of our clients, these high interest rates lead to years of financial struggle and stress. But there are some benefits to having a high credit limit, especially if you are a financially-savvy person who pays off your account each month. Let’s discuss some of these advantages in more detail, as we show that having a higher credit limit can actually lead to a more stable financial outlook. When you get a higher credit limit you might simultaneously be getting a higher credit score. The reason for this has to do with that’s called your credit utilization, and this makes up the portion of your credit score called “amounts owed,” which accounts for about 30% of the scoring formula. 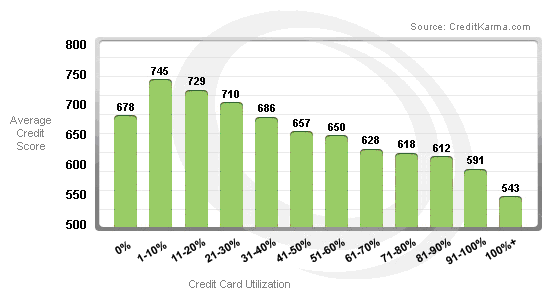 Your utilization shows how much credit you are using compared to how much is available to you. All things equal, your utilization will lower when you have a higher credit limit. Of course, this won’t be true if you carry a balance higher than before, so be sure to pay it off before it’s reported to the credit bureaus. We discuss this technique in our post called 5 things You Don’t Know about Your Own Credit Card. There is one caveat here: be sure to check with your creditor about their policy for doing hard credit pulls before granting a limit increase. Some do it, others don’t, and the standards have probably loosened since the recession. You just don’t want to run the risk that this increase could affect your ability to get a mortgage or secure some other important type of credit. In those cases, a hard inquiry would likely lower your score by a few points in the short-term, but lead to an increase after about six months (all things equal). When you get a higher credit limit, if things go according to plan you should be able to improve your credit score. And by doing this, you make yourself more attractive to potential creditors. So in many cases, your access to credit improves as a result of a higher limit. You also have immediate access to more credit after getting a higher limit (by definition), which can prove useful in certain situations. But, of course, you will hopefully have an established emergency fund so that you don’t need to rely on a large line of credit to bail you out of an unexpected situation. If you are a big spender and use your credit card for many purchases, you might get tired of frequently having to pay down the balance in order to be able to continue using the card. This can be a mildly frustrating experience, especially if you have to wait a business day or two for the transaction to process. A higher credit limit will help keep this issue from bothering you. On a similar note, consumers who spend a lot on their credit cards have the potential to rack up some significant rewards points or cash back opportunities. If you have to stop spending on a credit card and are forced to use a debit card or cash instead, you might be missing out on these rewards. Obviously, we don’t want you to end up spending more money by chasing rewards, but if these are purchases you have to make anyway, getting the additional rewards makes a lot of sense. If you have a higher limit, you will be able to buy more and end up getting more back as rewards. We hope that these explanations have helped clarify why a higher credit limit can sometimes be a good thing. But remember, make sure to check with your creditor’s policy regarding this before you ask for a higher credit limit. And, use caution when you spend a significant amount of money on credit. Be sure to have that money in another bank account so that you can pay off the balance, and make sure that you have emergency reserves on hand as well. If you are in a credit bind and need help making positive credit choices, or just want a budget review and an action plan for your financial future, be sure to contact us so that we can work with you through a free budget and credit counseling session. Iimits because, besides being a valued bank depositor, I have always maintained an excellent client reputation by being a deadbeat through the years of being a valued member/credit cardholder. Having credit cards with high credit limits is certainly a convenience because, indeed, the higher the limit, the higher the spending potential and the greater the purchasing power for myself. Being a financially savvy person who pays off my balance each month — a deadbeat, that is — having a higher credit limit has actually led to a more stable financial outlook for myself. Furthermore, I have become more attractive to potential creditors and other banks/credit card issuers who have offered me elite and first-rate credit cards that have higher annual fees and superb benefits. So in many cases, my access to credit has improved as a result of my twelve credit cards’ higher credit limits. Plus, they have enabled me to have immediate access to more credit after getting higher limits which have proven useful for myself in a myriad of situations. I am quite elated with my life as a millennial who is financially secure and is very intelligent in most respects of my life. Kudos to you for managing credit responsibly. You’re not a deadbeat in our book 🙂 but you are right that creditors often want us to fall into a trap. Awesome job avoiding that trap with your finances!